Sludge, Muck & Mud Removal | GeoForm International Inc.
Sludge is that thick, soft, viscous muck that can develop at the bottom of a waterbody over time. Any excess sludge accumulation can reduce the water volume in the body of water, jeopardize the health of the aquatic wildlife and pose numerous environmental hazards. Sludge can also produce a foul odor that can make visiting or working near the waterbody and unpleasant experience. 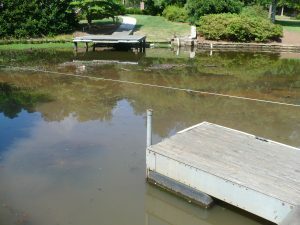 There are several ways to remove sludge from a waterbody. Dredging entails the use of a specialized machine that suctions the sludge from the bottom. A sludge removal pump can propel a wide variety of viscous materials to the surface for disposal. Aeration systems circulate the water and infuse it with oxygen, which promotes the growth of beneficial bacteria that consume the nutrients that lead to muck accumulation. You can count on GeoForm International to carry the best sludge removal product for your waterbody. Our compact Dino6 and Dino8 dredges can remove accumulated muck from the bottom of bodies of water, while our submersible pumps for viscous material can pass all types of muck and debris. Our aeration equipment will circulate water efficiently and provide the oxygen necessary for sludge containment. Contact us to learn more about our sludge removal systems and see how GeoForm’s product line can work for you! "I have been impressed with our Dino6 dredge. It delivers on the promises of ease, portability, and the GeoForm tubes have less environmental impact on the sites dredged. The website and onsite training was well worth the time."